Global Autoshop carry full line of Bilstein products, please contact us for more information. Since our inception over 40 years ago, Bilstein has been a unique and driving force in the auomotive suspension industry. From racing and testing in Formula 1, NASCAR, SCCA, Rally, and Off Road to original equipment on BMW, Ferrari, Jaguar, Mercedes-Benz, Porsche, Subaru, Toyota and GM trucks, Bilstein Gas Pressure Shock Absorbers haven proven to be the best. If you've never experienced the exhilaration you feel when driving a vehicle equipped with Bilstein Shocks, you're in for a pleasant surprise. You'll soon discover there is, quite literally, nothing like it. Unbelievable control. Precise handling. Ultimate performance. And incredible comfort. Most conventional shocks are made with shock bodies cut from a piece of steal tubing, stamped internal parts and compromised tolerances. In contrast, Bilstrein's shock bodies are precision formed through a unique seamless extrusion process. This provides superior strength along with high finish tolerances that are usually associted with surgical instruments. The finished body is then mated with a solid, induction hardened steel chrome plated and polished shaft, machined valving components and highest quality seals. Combined with extreme attention to detail, Bilstein provides you with the closest thing to a hand built shock available today. Evolving from a history of worldwide racing dominance, Bilstein has developed the ultimate automotive performance suspension systems. To insure maximum performance, these systems utilize Bilstein's superior monotube gas shocks, featuring: Largest available piston diameter for greater sensitivity and precise control. Patented digressive piston head design and deflective valving instantly reacts to changing road conditions. Monotube design dissapates heat more effectively than a twin tube shock for cooler, more efficient operation and longer life. 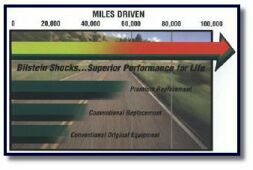 Lighter weight reduces wear and tear on suspension components. The Bilstein BTS Suspension components provide a dramatic increase in your vehicle's performance handling characteristics. The BTS consists of 4 coil with a performance directed spring rate and Bilstein's patented monotube gas pressure shock absorbers. The sport level valving is specifically tuned for your specific vehicle. The BTS system provides a lower stance and a firmer ride for better road handling and control. This is the most economical way to vastly improve you car's performance and appearance. The Bilstein PSS Suspension allows you to adjust your vehicle's ride height without the expense of the fully adjustable damping system. This system features both coilover and standard monotube gas pressure shocks with performance level valving along with application specific, progressive rate coil springs. The PSS system lets you set your car low and tight for optimum performance or back to a more stock like ride height and handling characteristics. Ride height adjustments can be made on the vehicle without removing the suspension. The solid aluminum spring seat and lock nut allows a selective adjustment of the vehicle's ride height. Spring travel and vehicle body height change, but the spring seat remains pre-loaded throughout the allowable range of adjustment.